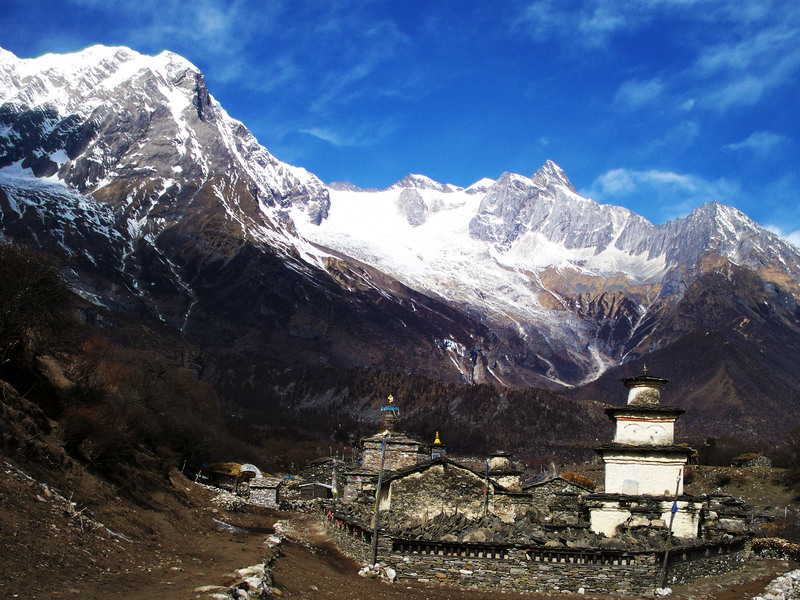 Manaslu Trek Rising 8,163m, Mt. 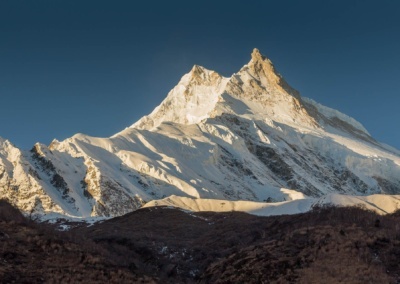 Manaslu lies just east of the famed Annapurna Region and shares a border with its northern neighbor Tibet. Opened to trekkers recently, Manaslu’s unsurpassed beauty and rich cultural traditions offer the dedicated trekker a genuine adventure. This trekking trail offers brief glimpses into the simple lives and ancient ways of the areas inhabitants. rivers and waterfalls, and the rushing, rumbling tumult of the frigid waters accent the silence of towering pines and lush bamboo groves. During the day, the sun shines with clear intensity, while the nights are a bit more than cold. Moreover, villages and people become less frequent as the trekking becomes fairly strenuous. At this point you are more likely to pass a yak, cow or a sheep along the trail, rather than a person. Following Larkya Bazaar, the trail rises to over 5,200m as you cross the Larkya Pass under the glow of soft, winless moonlight and twinkling stars. Buttressed by peaks reaching over 6,500m and covered by snow year round, Larkya pass commands your utmost energies and respect. Having crossed the pass, you will quickly descend through an area whose vegetation is at once both alpine and tropical. Long-needled pines are draped in soft, ne ferns. Maples and elms share the ground with bamboo. Frigid, rocky streams are beached by cotton-white limestone sand, and glacier lakes glisten with an aqua-blue green. The colors, sights, silence and sounds embrace every turn of this gently sloping section of the trail. Day 01:  Arrive Kathmandu International airport, MTM staff meet and transfer to hotel on bb basis. Day.02: Kathmandu process for permit and evening collect special Permits. O/N in Hotel on bb basis. Day 01 Arrive Kathmandu International airport, MTM staff meet and transfer to hotel on bb basis. Day.02. Kathmandu process for permit and evening collect special Permits. O/N in Hotel on bb basis. we reach a widening of the valley, opposite the point where a large tributary stream enters the Burigandaki. The terraced farmland here belongs to the village of Lapu besi. Trek descends once again to the wide, sandy riverbed and follows a path, which runs below the steep, craggy valley side. At length, we have to climb up once again on a trail to Macha Khola. a suspension bridge. The trail is quite exposed and challenging in places. After a short section of forest path we reach the single teahouse at Doban. Above Doban, the Burigandaki descends an impressive series of rapids. Beyond this steep section, the river is much more placid, meandering across a broad gravel bed. At Lauri, we recross the river on a suspension bridge and then climb on a high path to the elds of Jagat. off towards the Mustang. Our route continues upstream, through a gorge section with towering walls. We cross the river three more times in the next two hours to avoid dif cult valley sides and then climb up over a further steep spur to reach the village of Deng. The valley is still steep- sided and most impressive. We cross to the village of Lana, and start to see mani stones, a sure signs that we are entering high country Buddhist regions. After only about four hours we reach our place at the village of Ghap, which straddles the river. 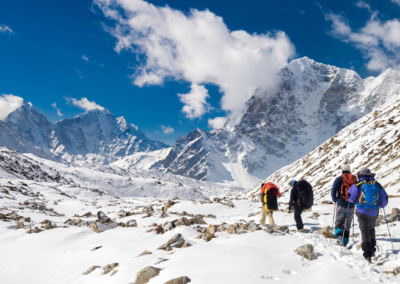 We have entered the Tibetan areas and the cultural change is obvious, and the climate change is also obvious the trekking is pleasantly cool now, as we start to fain the altitude. take the smaller direct trail. We pass thru Lho, a large village at 3150m where there is a lovely little monastery and numerous chortens and manis. Looking back Ganesh I is visible. Leaving the village, we follow the Right Bank of the river, with views of Peak 29 ahead. 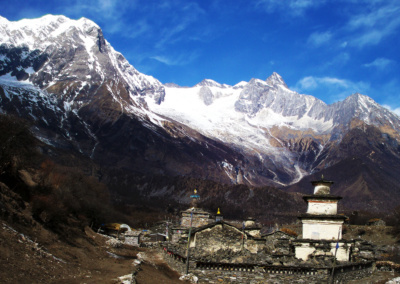 At a fork in the trail, we take a detour to the left, which leads up to Honsansho Gompa and the Pungen Glaciers, from where there is a stunning view of Peak 29 and Manaslu. explore and acclimatize for the next few days. O/N in Lodge (BLD) Surrounded by mountains in a peaceful forest, we take a rest day to acclimatize and relax. look around. Descending to the main trail via a direct route, we soon reach the elds of Samagaon, 3500m. We camp at Sama Gompa, 20 minutes beyond the village, or Samdu, near the Tibetan border. 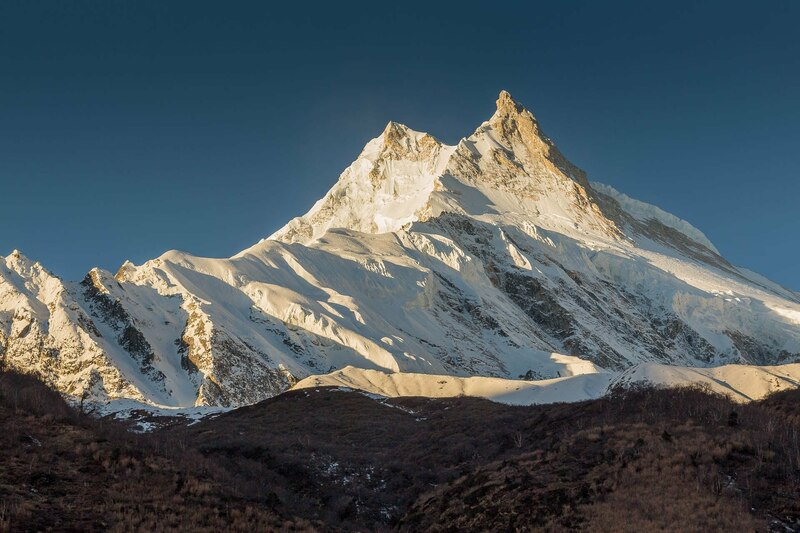 as spectacular as they get and Manaslu is particularly impressive. After crossing to the East bank of the river, we reach the last permanent settlement in the valley, which is called Samdu. After a short climb above the lodge, we reach the ablation valley on the North side of the Larkya Glaciers. There are views of Cho Danda and then of Larkya Peak. Finally, we walk across the moraines of the glacier, making a gradual ascent, which becomes steeper only in the last section to the pass. The valley system here is huge and well worth exploring.Communities: The Gurungs are a distinctive and interesting ethnic group found mainly in the central hills. They provided the Gurkha army with many of its men and so occasionally your greeting of “Namaste” is returned in fluent English with a cheery “and a good morning to you”! Their religion is a combination of Hinduism, Buddhism and Animism.